Anytime Peter Bakker of Bakker Yachting Electronics gets in touch with me, I know it’ll be about a high quality design and installation. Previously it was about luxury sailing catamarans. This time though I got even more excited, as Peter’s most recent project is a 19.5 m DSV (Dive Support Vessel) Jet Cat.Why so excited you may ask? These days I’m a leisure sailor, but in earlier times I was a Jet Cat Workboat Master and dive support ROV Pilot. 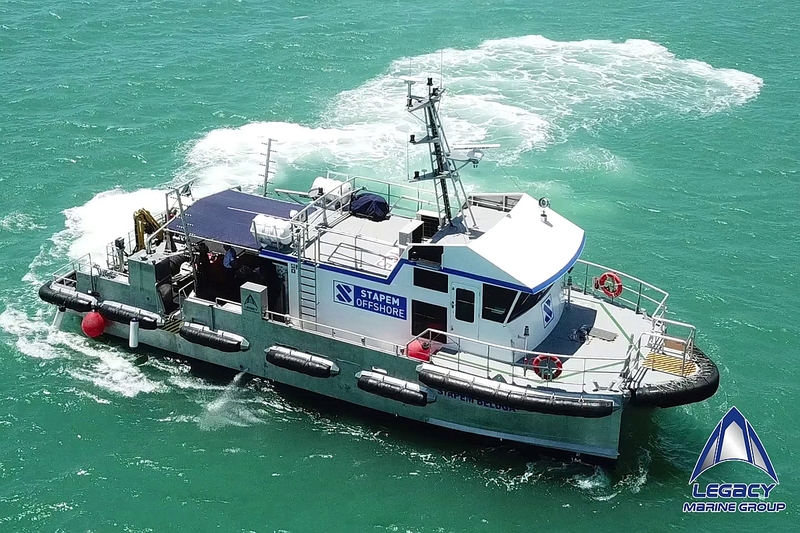 So it’s not surprising that this Incat Crowther designed 1900 DSV Workboat you see pictured above, built by Legacy Marine South Africa for Stapem Offshore, takes me right back to my offshore commercial working days. Be it above or below the surface those professions have to be the most fun times I’ve ever had at sea. Mind you off the Beaufort scale winds with 60 ft waves, in a Cod war, in my youthful Royal Navy steam engineering days bordered on fear, more than fun! Back to the present. 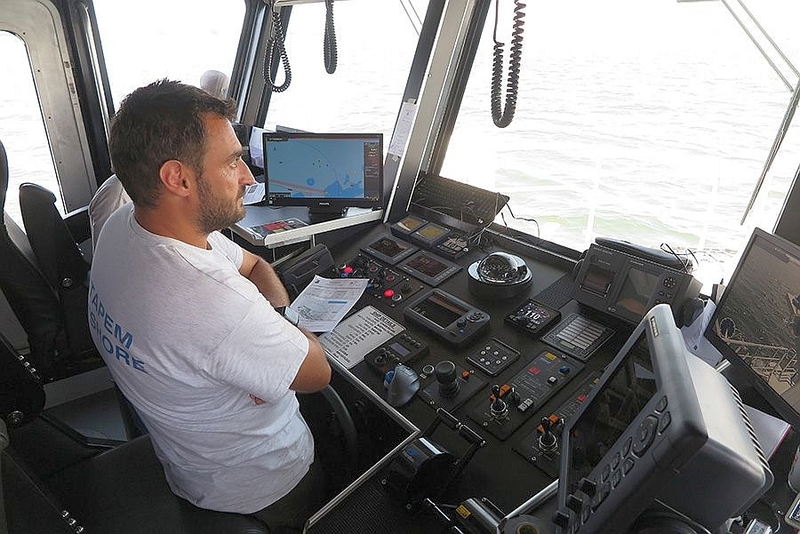 Anything to do with diving is all about safety and system redundancy – where systems have to be to a quality specification and to standards that ensures the safety of the vessel, vessel crew and the divers they work with. The Stapem Beluga Cat is such a beast, being the first of two built by the Legacy Marine Group, certified to American Bureau of Shipping (ABS) standards for this class of vessel. Why not take a look at this video of the Stapem Beluga, before we investigate the Victron kit onboard. 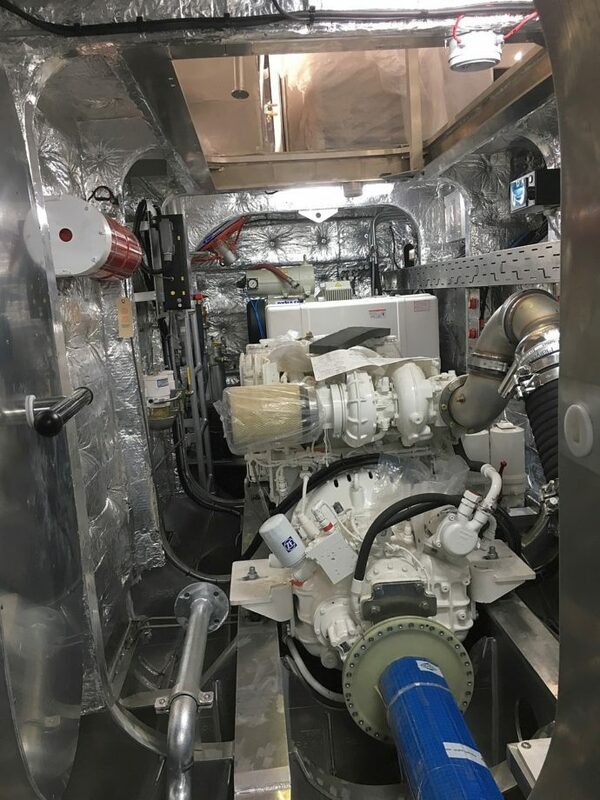 In build – One of the Inboard MAN 560HP main engines/ ZF gearboxes / HJ403 Waterjets. On the water – Bridge with elevated view. 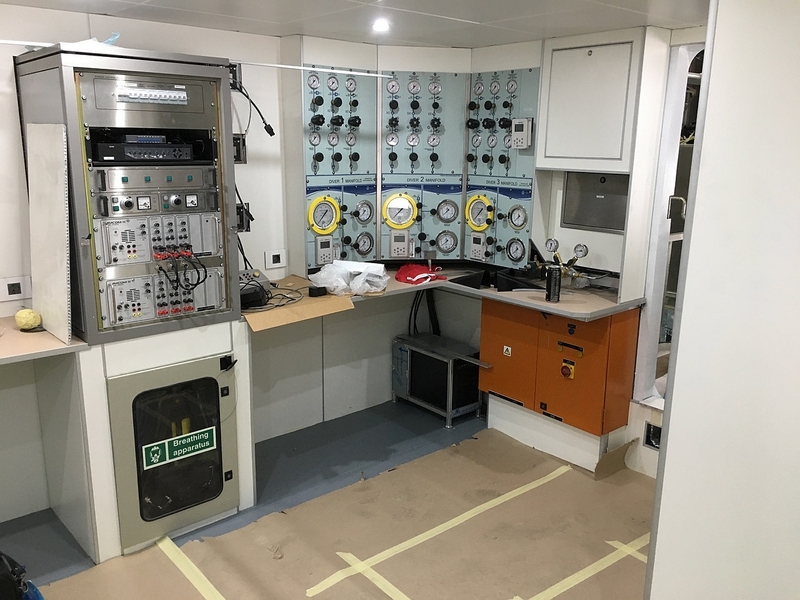 In build – Dive station with multiple video monitors, DVRs and comms to direct underwater operations. 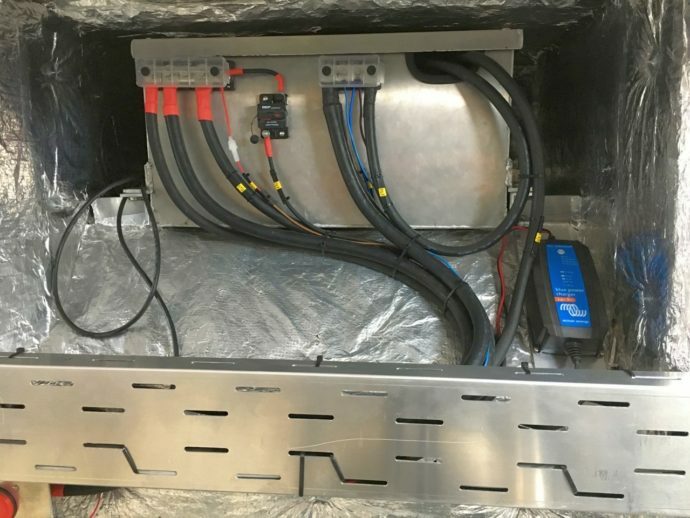 “With this build we couldn’t use any extra alternators for charging the service batteries and therefore had to come up with a different plan. Normally there’s always a generator running (main or back up) and this will supply enough AC power to the Quattro to maintain a healthy state of charge and to supply 24 Volt power without draining the service batteries. If however – and for whatever reason – the generators fail, you would discharge to empty pretty quickly as charging would stop. 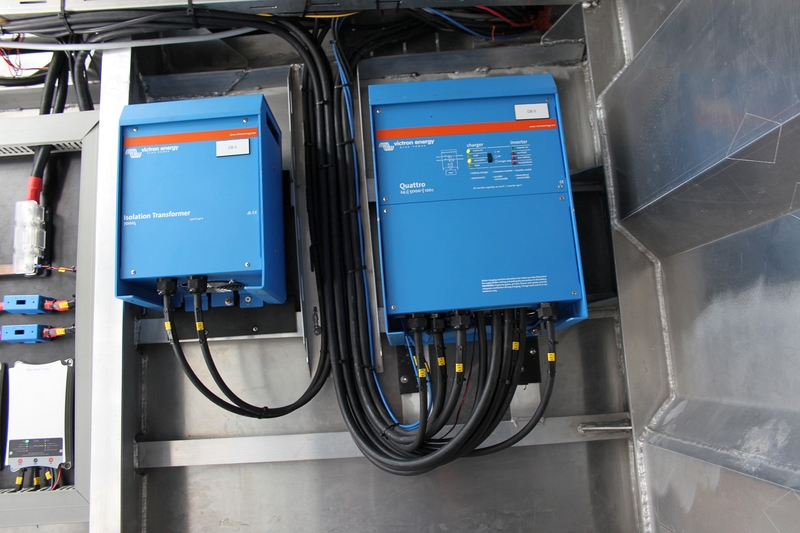 By using two Buck Boost converters, one per engine, this can be prevented. In total this gives about 50 Amps charging power to the service batteries. Each Buck Boost only kicks in when there is no AC power available on the Quattro’s input and the engine to which the Buck Boost is connected will then run. This has been done by updating the Quattro’s firmware to Assistant usage – and by using both relays inside the Quattro as so called Event relays. 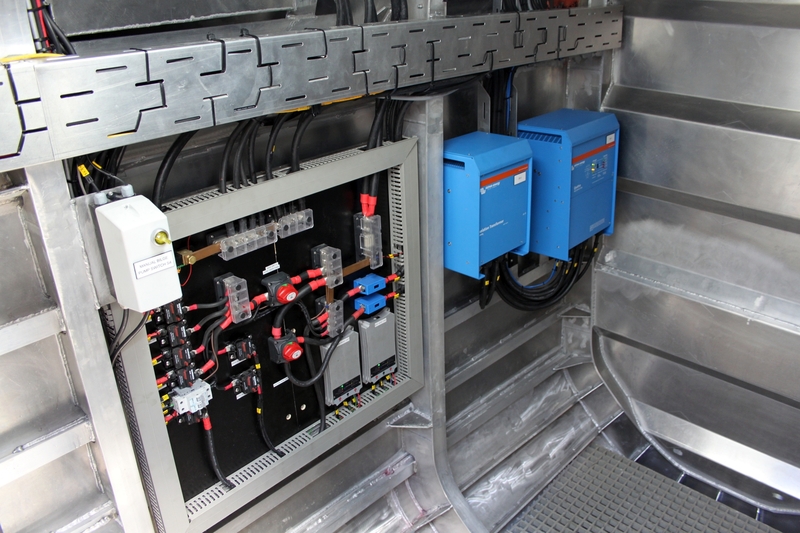 There is a UPS system onboard for the entire Dive Distribution Board, but the Quattro gives extra security as a double back up power source in case of emergencies, even if both generators fail. Distribution with the two Buck-Boost DC-DC Converters – the two grey units, bottom right on the distribution board. Blue Power IP65 charger 24V 5A. Isolation transformer 7000W 230V and 5kVA 24 Volt Quattro. Blue Power IP65 24V 8A Charger. A quality design and install I think you’ll agree. 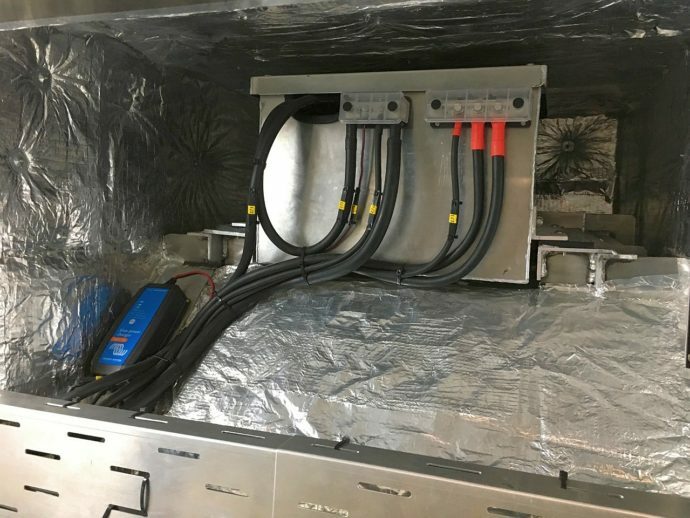 I would have liked to have included the full engineering wiring diagram that Peter did for this project, as it too is to a very high standard. However that is proprietary client information, so hopefully the photos in this blog have done the talking instead. We look forward to hearing about the second vessel in this series – the Stapem Narwhal. My thanks to Peter Bakker of Bakker Yachting Electronics and Julius Hess of Legacy Marine Group for the information and images used in this blog.